It’s a matter of getting an olive into your martini from across the bar. According to the handbook for “extreme bartending,” this sort of performance excites clients, alleviates boredom, speeds consumption, and sells liquor. Recently, while witnessing an example of extreme teriyaki, I was reaching for the wasabi when a flaming cleaver landed dangerously close to my hand. In any case, the next morning I had to have my suit dry-cleaned. While I was waiting for this to happen I was realizing the value of extreme painting. Pollock, de Kooning, the Expressionists. Secretly, you can do it yourself. Like extreme naked rumba, it’s also okay to do it alone. Try squeezing out four times your regular amount of colour. Dig out that giant brush you’ve never used. What’s wrong with dribbling anyway? Who said you couldn’t flick a ball of paint across the studio? What else is there around here? A good elbow, a whole sweater, the dog’s tail? Anyway, we’re talking “warm up” here. And seriously, it’s valuable. It’s valuable because pushing yourself to extremes blows out the cobwebs of trusted habit. It shakes up what you know to be reliably safe and substitutes the miracle of insecurity. Going pantless over the ski-jump does something for the blood. Speed alone gets the red stuff coursing. Here’s an exercise: Make a big painting — complete right down to the signature — in the morning before your coffee gets cold. A great big whatever. Do this every morning for a week. What you’ll find is that it’ll have a positive effect on your regular work. You’ll do better and you’ll do more. You’ll start to process ideas faster, work more efficiently, and you’ll be more generally inventive. The blast of excitement will invigorate, and you’ll be less tired at the end of the day. You don’t have to show this stuff — they may even turn out to be sorry sights — but you never know. Life’s an exercise where we have the choice to test extremes as well as to work the tried and true. Both have value. But if we never test the extremes — well, we’ll never know. This letter was originally published as “Extreme painting” on November 23, 2004. November 23, 1004! Wow. Robert was prescient. But seriously … right up until “in the morning before your coffee gets cold” I thought this one was from Sara. LOL. What a stimulating idea. I know intuitively I will embark on this voyage of discovery soon. Refreshing and freedom giving exercise of discovery . Thank you, Robert, for sharing the youthful aspect of your intellect. It will live on within all who accept your gift and invitation. Go where fear thrives and pour, splatter, move the canvas. The past five months have liberated me from stereotypes, overcome tremendous fears and uplifted creative spirits. This post confirms what I am attempting, and the process continues! I have a big smile on my face…still tuned in to your dad…this synchronicity used to happen often…I woke up thinking I should make a series called Going to Extremes to push myself! Thanks to you both for backing me up! Great letter, and not just the message, it is written so well! And it’s all so true. There is nothing in the studio as emotionally (and physically) draining, than finding the same thing on easel day after day, week after week. Haha. Again, I laugh when I read your dad’s humourous proddings. I could see the twinkle in his eye as I read this one, imagining going pantless over the ski jump. What’s more, I’m heading to the kitchen to see what I can find. Great gobs of paint lie waiting on my palette. Thanks, Sara. Precisely my sentiments on the subject. 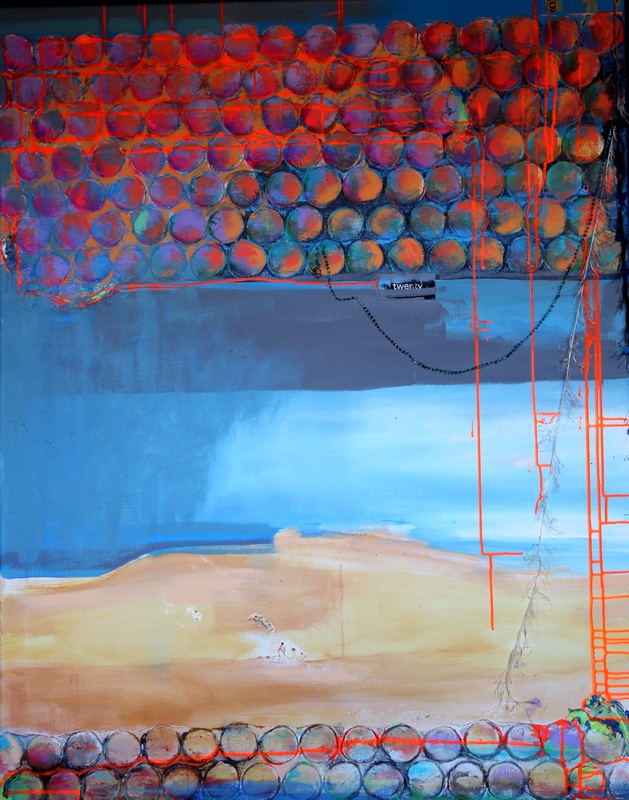 Leaving behind representational art and exploring the bold, brash and spontaneous nature of extreme expressionistic painting has given painting strength with greater conviction. Working on large 48×60 canvas, pouring paint from the bottle or smearing globs of paint with rubber gloves has broken free the rigours and tedium of the known. Developing the work beyond it’s initial smathering allows the intellectual mind and critical eye to develop purer aesthetics. It’s been free-forming and creatively enriching. Along the way discovering a love of abstracts, the purity and freedom of expression with a surge of vitalized energy. Caution: not for the tender hearted. Be bold, be strong. 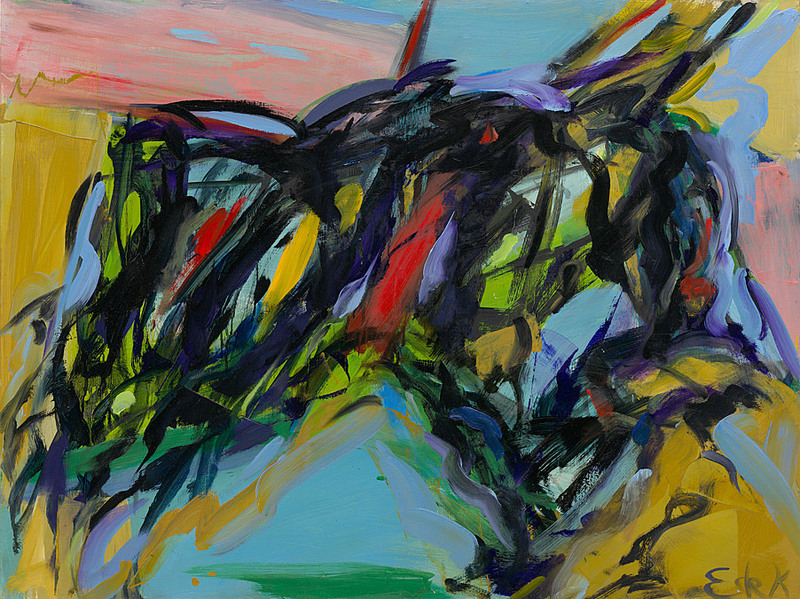 Elaine de Kooning was my mentor in my senior year in college. She was most encouraging at a time when I needed it. She was an advocate for large sized paintings. The biggest I ever did was 6 ft. x 4ft. There is something challenging and liberating about big canvases. But more important is the process of doing it. 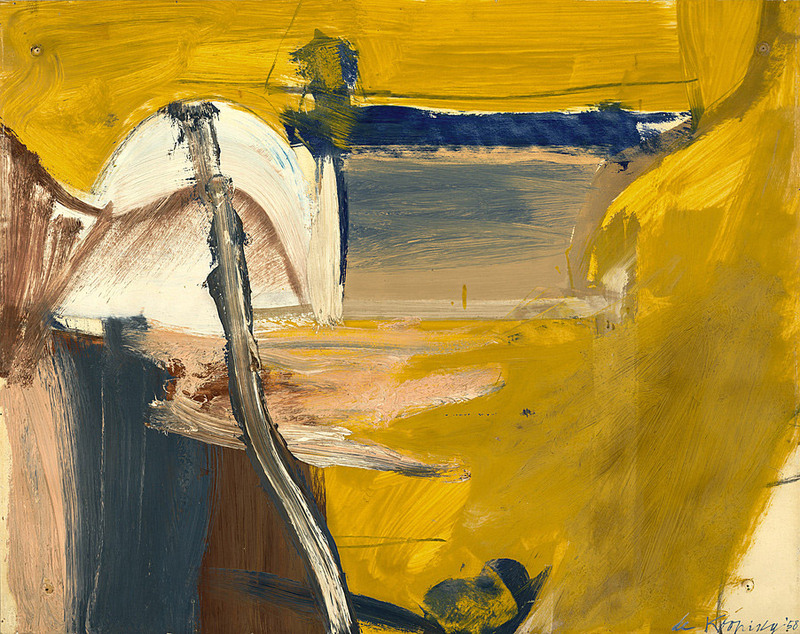 Abstract expressionism may be an “old school” now, but for those of us still in that mode, we find every moment a surprise, an opportunity and an inspiration separate from analytical intellectualization and representational images. So enjoy this whole conversation we are having with Robert and Sara. It keep us fresh and hopeful and connected to something we love to do. Someday I will get to painting everyday, but until then these ideas will keep the candle burning. you said, sometimes a mess. I save the pieces of ‘mistakes’ if on paper and cut or tear them up for a later Collage,. One writer said he never worries about making a mess in his “space”. My space is unfortunately my Dining Room. I cover everything with plastic drop cloths and sheets, dependent on how crazy I intend on being with the paint, or work at the Kitchen sink. I had a commission of two canvases, each 6′ X 6′ and managed them after moving the furniture. The Artist always finds a way to bring new life to the work. I will share your great letter with an individual who is timid about trying new things. But isn’t this how genius comes to the fore? Thank you for this inspiring idea! I will. I will! I will! POWERFUL STUFF! I’m looking at a canvas that has been tucked in behind the bookcase here in my studio for YEARS! We have a coffee date for early tomorrow morning! Thank you for a creative boost today! An artist friend shared this post with me, knowing I’d completely get it. As an abstract painter, (many of the master Abex painters are my heroes), I totally connect with this post. I offer private “coaching” in my Studio and my priority is taking students out of their comfort zone. Most know what they are in for, and although I often see trepidation on their faces when I suggest something foreign to them, ie: a giant brush or squirting out a whole tube of paint, in the end they are excited, inspired and recharged. In the creative process, the predictable and business as usual, is safe…but not thrilling. Taking risks, going for it, and trusting the process are all key to evolving as an artist. I have an Eleanor Roosevelt quote on my Studio door: “Do one thing everyday that scares you”. Every artist should practice this mantra in their own work. My daughter and I are building a website for creative writing using a similar concept. Called ‘tencil’, you make up or use a prompt of our creation then a timer begins…you have 10 minutes to write whatever you feel. The first few time we ‘played’ this we read our stories aloud to each other – very invigorating. Now we write them at the IOS app, post them to the site – or not if you don’t care to share. When posted readers can browse multiple tencils on the same starter sentence. At first I wasn’t sure I could write anything of value in just 10 minutes(plus an edit of + or – 20 characters) but now I look forward to the challenge. I am always surprised with where my mind takes me under the time constraint. A great way to start my creative day! 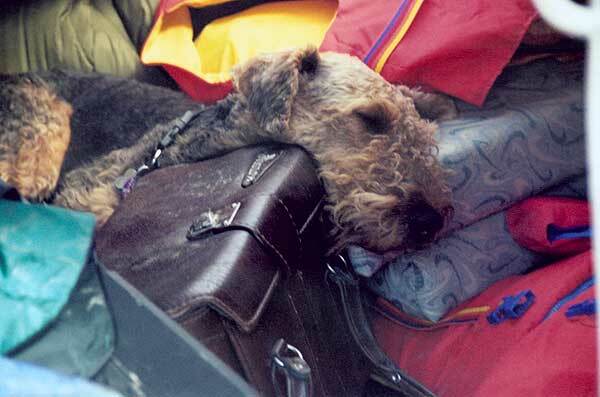 I have an Airedale called Frankie. Several times she got into my paints—using my good rugs as her canvas. After reading this post I think I’ll try tying a brush to her tail and see what happens. I have these four panels of 48″ square…. mmmm. There is something so powerful about possibilities…… And seductive. I just had a 8×6 ‘ canvas delivered to my home….. It raises so many questions and challenges…. Size of tools and amount of paint and mediums. How to transport it. Wow! It is just so exciting thinking of the possibilities, my inner child (artist) demanded the opportunity or challenge… To go where no man has ever gone before, who can resist the call? Thank you Sarah and Robert for continuing the conversation, it has been an awesome gift. I got so happy – profoundly happy – to finally be emotionally able to help the groups whose progress saved my children, after their Dad’s sudden and untimely death from the issue – with donated art from me, that one of the several california poppy paintings for the CA based group took me over and I splashed and daubed the COLORS on the claybord, in pure victory and rejoicing – and then worked out the composition! YES!!! Fortunately, you can DO that with claybord and its even art! Personally…everyone should do at last one extreme painting every spring! If art is life is art etc….. every spring , one extreme painting helps to say it!